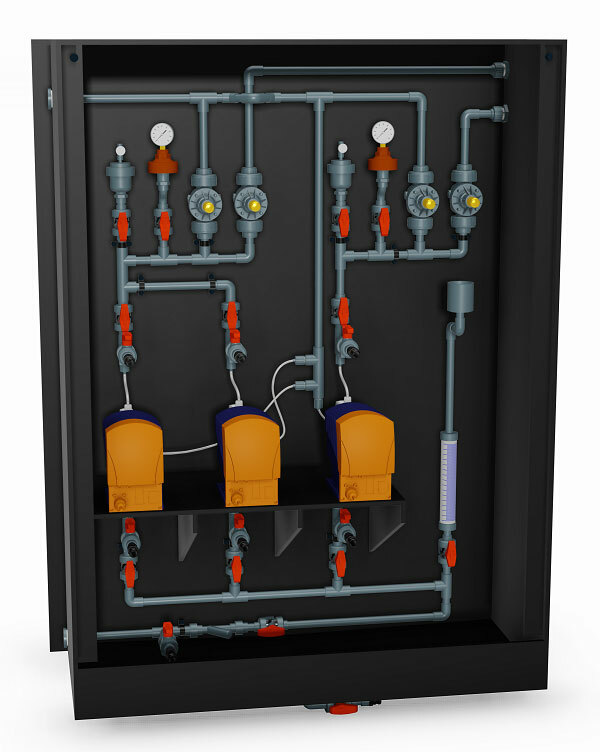 We can provide chemical dosing systems fully installed electrically and mechanically on a skid. You can then simply bolt the skid down and connect to your process. All systems come fully wired, piped and factory tested, ready for operation. Our quality design and fabrication system saves you time and money by minimizing site time. Download the Chemical Dosing Systems brochure and complete the ident code online using the button at the top of the page. 30% sulphuric acid at tight accuracy is required in a pellet reactor for a large fertilizer manufacturer. 98% sulphuric acid is available on site. 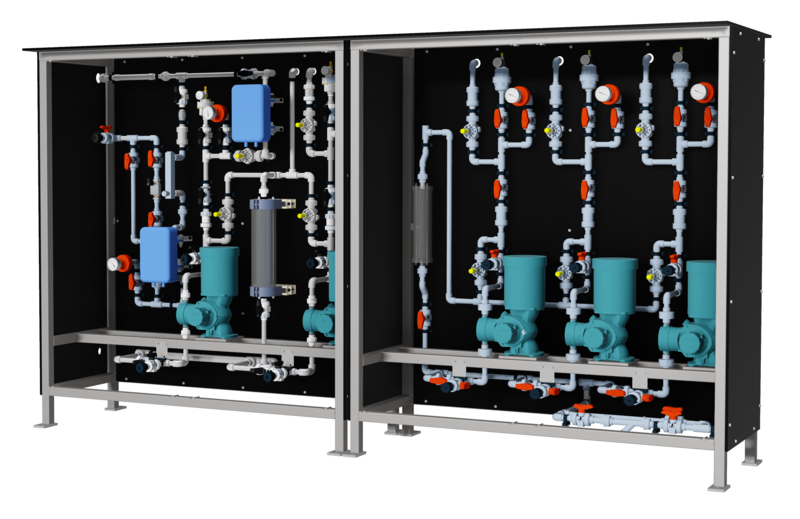 Dioxide Pacific was engaged to design and construct a dilution system to create 30% sulphuric acid at 27 L/hr continuous flow. There are two dosing skids. The first is for accurate metering and dilution of the 98% sulphuric acid using a Milton Roy dosing pump. All materials in contact with 98% sulphuric acid are PVDF or PTFE. The skid contains a calibration cylinder, metering pump, load valve, relief valve, pulsation dampener, isolation ball valves, pressure guage, mag flow meter and static mixer. Water flow is controlled using a needle valve, rotameter, PRV and mag flow meter. Using the actual water flow and a flow pacing ratio set on the HMI, the 98% sulphuric acid is dosed and using the flow measured value and PID control, the dosing pump speed is adjusted to get exactly 30% at the outlet of the static mixer. Hot acid is fed into a large storage tank to cool. The second skid is for transfer of 30% sulphuric acid to three dosing points with individual metering pumps. Piping is CPVC. Both dosing systems are mounted on 316 s/s skids with HDPE splash cabinet and polycarbonate splash shield and a central control panel with Allen Bradley PLC and HMI. The customer was able to see the complete FAT (Factory Acceptance Test) without needing to travel to the Dioxide Pacific factory. The FAT was recorded on video and transferred to the customer by Dropbox. The customer viewed the FAT and was able to approve the system performance. This was a big saving of time and cost. Including duty and standby dosing pumps, mag flow meter, calibration cylinder, load valve, pulsation dampener, suction strainer and GF ball valves. Complete system mounted on HDPE skid floor mount skid with spill tray and drain valve. 500L HDPE storage tank with ultrasonic level transmitter and magnetic level indicator. The purpose of the system is to dose a fixed volume of additive into a product by a counting pulses from a mag flow meter. The operator enters a batch volume into the HMI and a dosing pump is started and stopped using the accumulated volume from the flow meter. The plant transfers the additive from an IBC (tote) to an intermediate tank using an air driven diaphragm pump. The dosing skid includes electronically controlled motor driven dosing pumps, mag flow meter, calibration cylinder, load valve, suction strainer and GF ball valves. Complete system mounted on HDPE skid floor mount skid (with splash proof doors), spill tray and drain valve. The dosing system is controlled via a central control panel with Allen Bradley PLC and HMI. System was designed in 3D, fabricated and assembled with FAT (Factory Acceptance Test) prior to delivery. For further information on skid mount chemical dosing systems, please complete the feedback form on our Contact page or phone us.